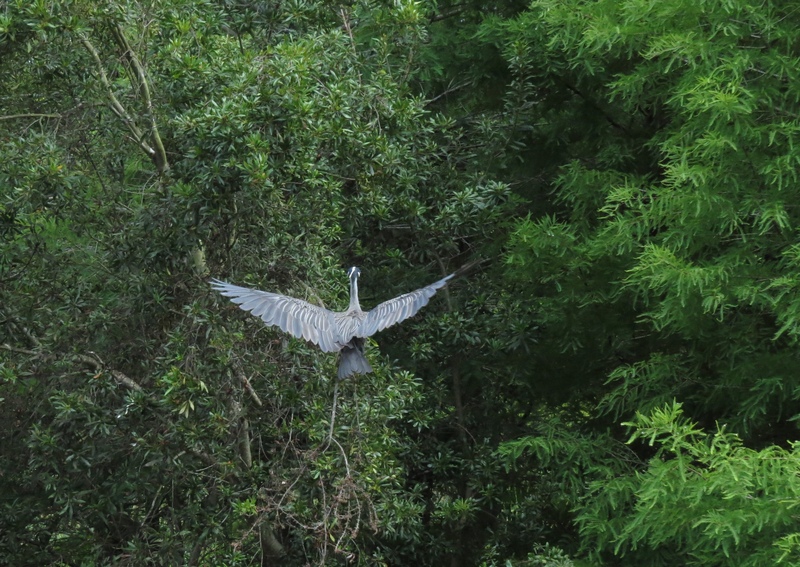 There’s a well-shaded pond (referred to as the “Alligator Hole”) where we can catch a glimpse of the Night Heron families each year, sitting up in the Cypress trees. 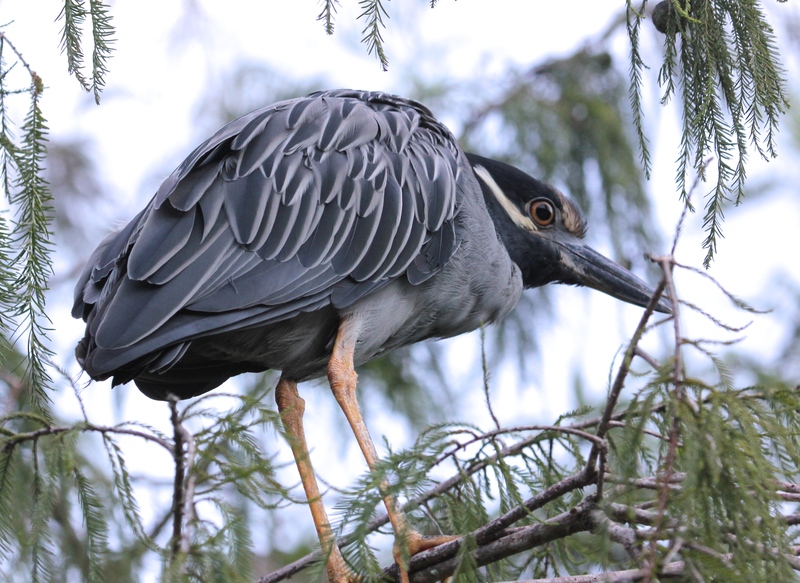 There are both Yellow-Crowned Night Herons and Black-Crowned Night Herons here in our preserves. Both of these birds are large, but have shorter necks and are stockier than many of their more graceful, long-necked Egret and Heron cousins. The Black-Crowned seem to prefer fish, and the Yellow-Crowned prefer crustaceans, but they both seem quite happy in the “Alligator Hole”/pond, where they find a variety of fish, snakes, small rodents, crustaceans, and amphibians to eat. 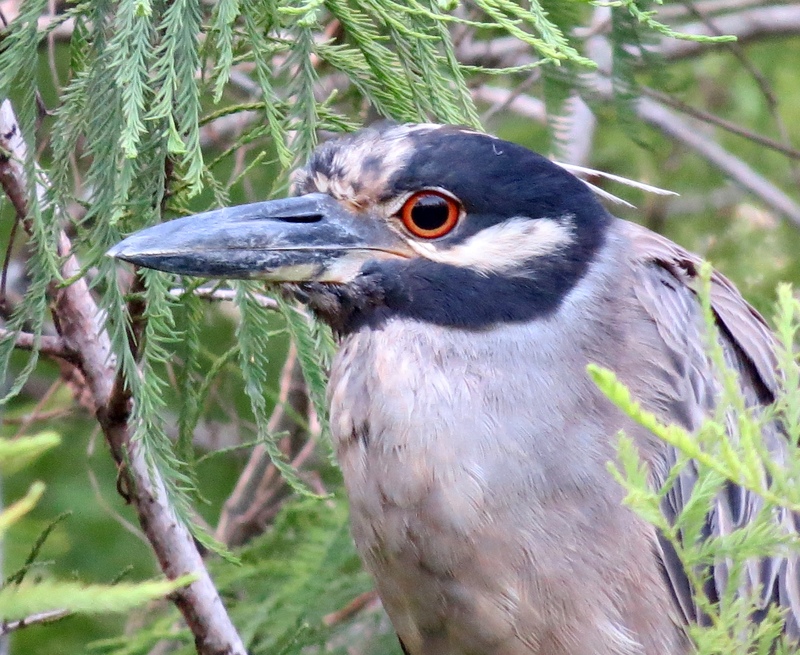 I was surprised to learn that Black-Crowned Night Herons, “who live in fresh, salt, and brackish wetlands . 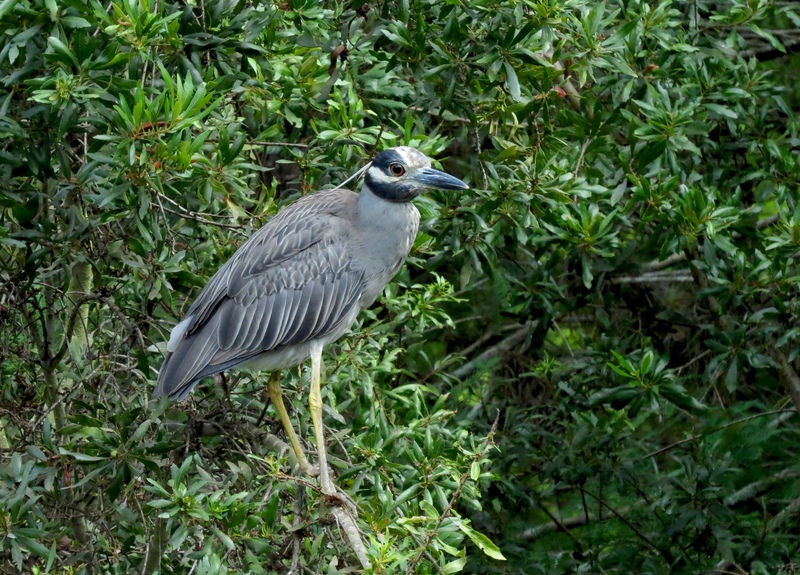 . . are the most widespread heron in the world.” (http://www.allaboutbirds.org/guide/Black-crowned_Night-Heron/lifehistory). Their global range is much larger than the Yellow-Crowned, but they are definitely less prevalent than some of the other herons that we see here in much greater numbers. There are juveniles at this time of year, too, like the one above and the one below. 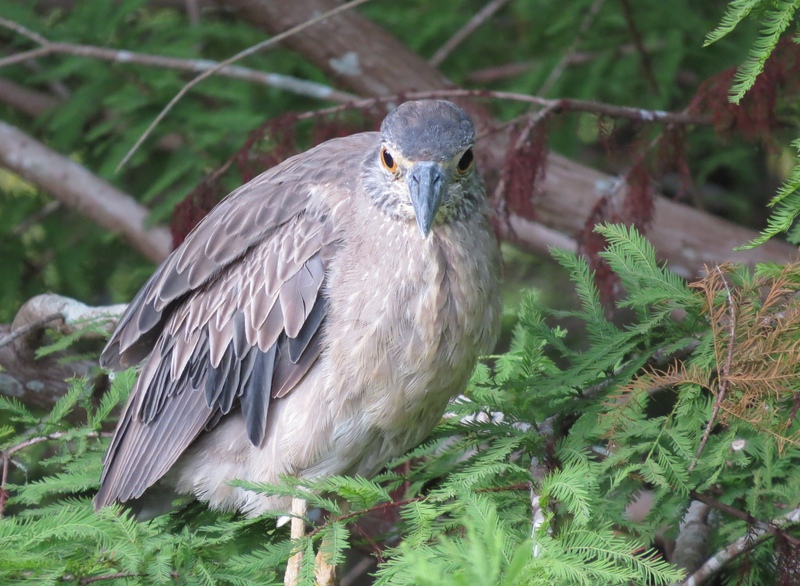 Juveniles of both Night Herons are generally brownish with white spots and streaks, until they gradually develop the distinct coloration of their parents. Personally, I still find it difficult to discern one juvenile from the other. We’ve seen several juveniles in the past couple of weeks, and these birds often return to the same nests year after year, but I didn’t see Night Heron nests this season. One year they nested in a tree overhead so close to the boardwalk, you could almost touch their nest! 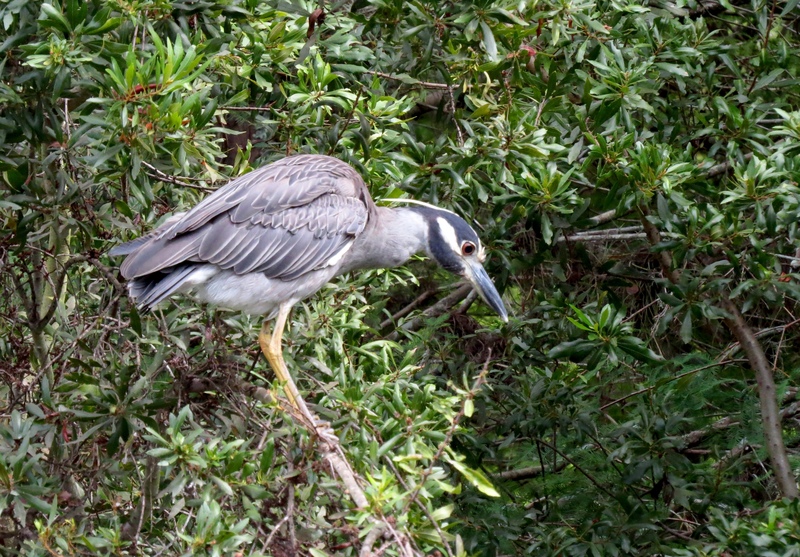 (See more at http://www.allaboutbirds.org/guide/Yellow-crowned_Night-Heron/lifehistory). Night Herons are most active at night (as you might guess from their name), so they are most often pretty subdued and hard to find during the day. In fact, even though it’s exciting to catch sight of them, they can be so inactive in daylight that it’s a big event when they close or open their eyes, or turn around! Just the other day, I was delighted to see this Yellow-Crowned Night Heron fly in suddenly and swoop right over my shoulder. They are nocturnal birds, but they begin foraging at dusk, so early evening is a good time to spot them. It was nice of him to stand out in the open for awhile! When I saw him lean over and look down, I even thought he might fly off again. Sure enough, he did fly off, just as I was looking the other way – missed a great in-flight, close-up shot! Oh well, maybe next time . . . 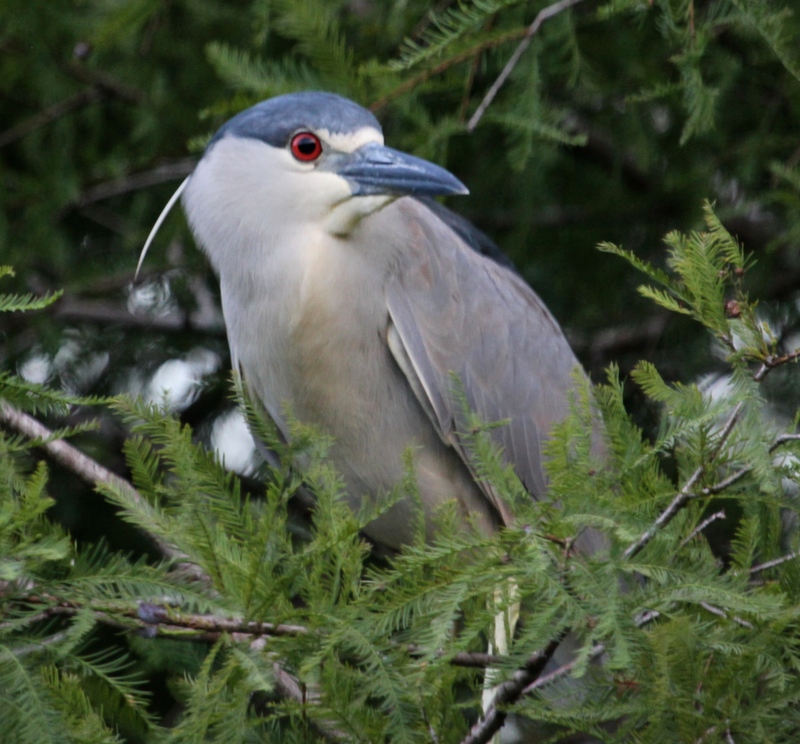 This entry was posted in Birds, Marsh/Wetlands and tagged Black-crowned Night Heron, Yellow-crowned Night Heron. Bookmark the permalink. Thanks AB! Even though I see these birds quite a bit, I really don’t know much about where else they are in the world beyond North and South America. Have to keep reading up on them…. Wonderful photos! 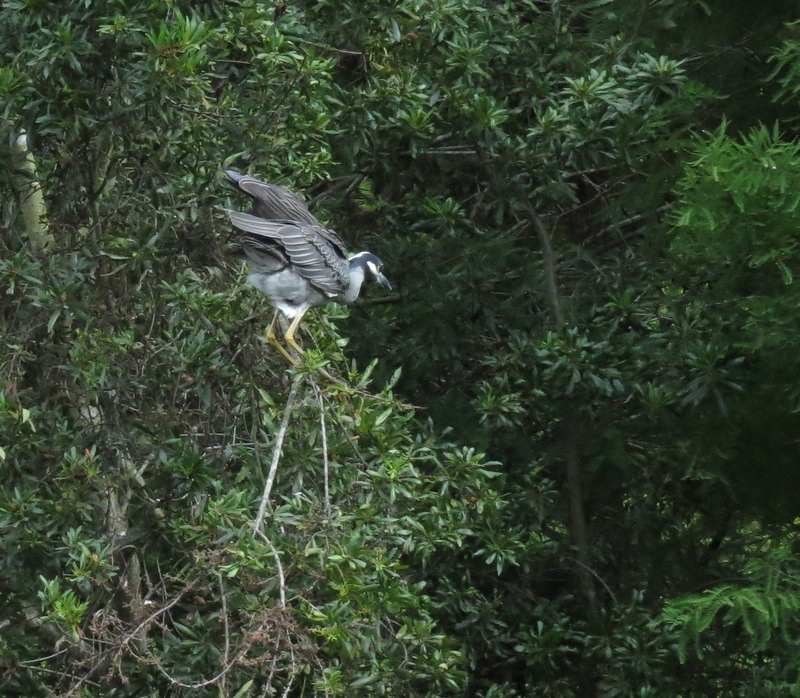 I never saw or even heard of a Yellow-crowned Night Heron. Wow! I’d never seen or heard of Night Herons, either, Donna, till I starting watching birds in Florida. They are really uniquely beautiful. My husband is a great ‘spotter’, and is always enthused when he finds them. 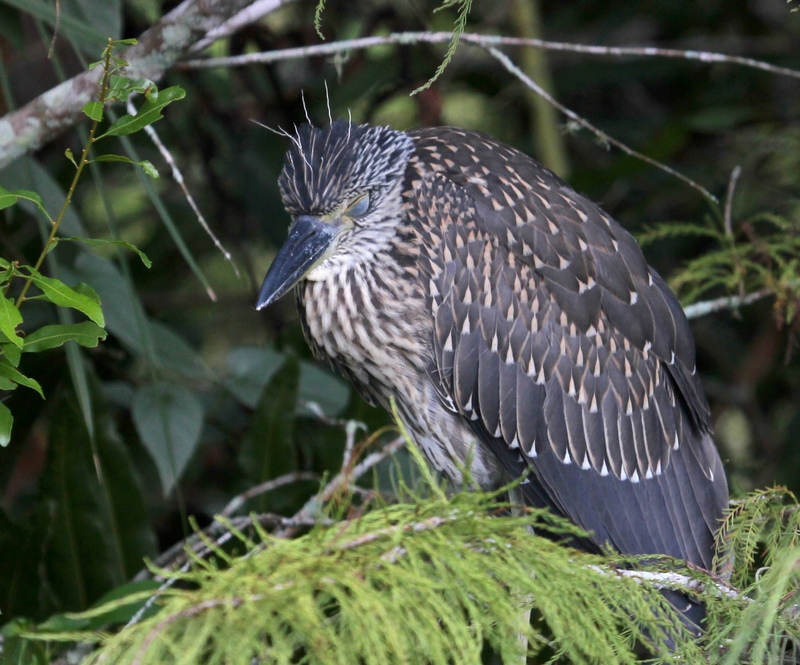 Wonderful shots of “little” night herons! I’m happy the one swooping above your shoulder didn’t scare you. But he owes you an inflight close-up 🙂 Luckily both “cousins” visit here too, and bring their juveniles along. When writing this post, I kept thinking of the title of a Broadway show called A Little Night Music . . . Thanks for your thoughtful comments, Tiny!